At 11:30 we will start serving lunch, thanks to our very own grillmaster, Mr. Jerry. At 1:04:52.5 PM the eclipse will begin (alt 66°), and we will have a Hawaiian Ice truck there for treats, on us! At this time, all students will be outside on the field by the school for the viewing. See note below regarding safety glasses. At 4:00:54.1 PM the eclipse will be over (alt 52°). We will still be here if necessary for unexpected late pickups as a result of traffic. If you plan to come observe with us, please park at First Baptist Church, just on the other side of the 92 overpass, and walk down. We will most likely have to use the parking lot as the trailer may not be picked up by then. 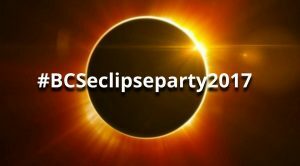 We are asking that parents delay arriving for pick up until 3:00 pm or later, as we have very limited space and all the students will be outside, it will be very dark around 2:35 during the peak of the eclipse. We want to ensure the safety of all students. Students can stay until 4:00 if they wish, to see the entire eclipse. The trailer will not be removed yet so our planned viewing area is now the parking lot. We also realize that with Cobb, Paulding, and Marietta City schools all delaying dismissal, as late as 45 minutues, there may very likely be unusual traffic patterns so we are prepared for later pick ups as a result. 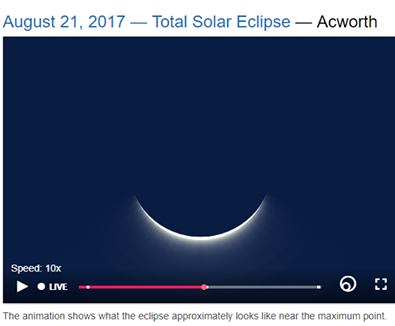 If you wish to keep your student home that day, or take a family trip to northeast Georgia to view the eclipse in the path of totality, or to some local science event, it will be considered an excused absence. However PLEASE take pictures and share them with us on social media! **We have enough safety glasses for all of the students and teachers, plus some extras. These glasses are certified to meet the standards for DIN ISO 12312-2-2015, They are approved by the ICS Institute for optimal safety. We will also have plenty of instruction on the dangers of looking directly at the sun. the eclipse without safety glasses. What we are expecting to see at maximum coverage. Previous Previous post: Check us out in Around Acworth!